Justin "Jay" Starrett finished Survivor: Millennials vs. Gen X in sixth place during Wednesday night's two-hour finale broadcast on CBS. Jay, a 27-year-old real estate agent from Fort Lauderdale, FL, was voted out of the Vinaka tribe before the Final 5 because no one left in the game wanted to go up against him in the end. Jay was a solid all-around player who was one of the biggest physical threats to win Individual Immunity Challenges. By the Final 6, he was the biggest threat in that fashion. He was also strategic and social, not to mention he found hidden Immunity Idols -- despite one fake one. In an exclusive interview with Reality TV World on Thursday, Jay talked about his Survivor experience. Below is what he had to say. Reality TV World: It was unclear whether you had told the jury about Adam's mother or if they heard it for the first time at the jury questioning from Adam. Can you confirm how that went down? Justin "Jay" Starrett: They heard it first from Adam. You're hearing now from Jay. This is a Survivor first. Reality TV World: The fact you didn't cover up your numbers to the combination lock was called a million dollar mistake. Has that haunted you ever since? Do you think you definitely would have won that Immunity Challenge had you remembered to flip the cover to hide your combination? Justin "Jay" Starrett: Yeah, I had such a huge lead on [David Wright] then. Props to [him]. He came back so fast on that puzzle it was crazy! But yeah, that definitely was my mistake, but I don't go to the past. The past is the past; you can't change it. Reality TV World: I was wondering if it really was a million dollar mistake though, because if you didn't win the next two Immunity Challenges, you'd probably go home anyways. Justin "Jay" Starrett: You never know! I could've gone on a run! Reality TV World: Did you ever remotely think the last idol you found might've been fake? Did you take a good look at it? And just to clarify, was a note in there? Justin "Jay" Starrett: David had the tools basically. He could've created me, like, a polished trololo bicycle. I would've loved it! David made a masterpiece. Dave had the note in there, it was tied perfectly, it was wrapped, it was in this coconut that got delivered to him from the heavens -- it was perfect for it. You don't understand. What the heck?! But my adrenaline was pumping so fast, I was just like, "Oh my God, I gotta hide it!" Reality TV World: When did you find out David was the one who had created the fake idol? And what was your reaction? Reality TV World: When you took Adam and David on the Reward with you, when you were eating steak, you promised to take the both of them to the Final 3 with you if they agreed to vote out Bret before you. Did you really mean that, or was that deal only good with Adam? Justin "Jay" Starrett: No, I would've done it! I wanted to take David to the end, and let the best man win. Reality TV World: Do you think you had a chance to beat him? Because everyone else in the Final 6 seems to think they wouldn't have a shot. Justin "Jay" Starrett: I don't know if I would've beaten him. I think we agreed, pretty much, that we would tie. I think it was either we were going to tie or he was going to win by one [vote]. Reality TV World: How easy a decision was it to steal David's steak reward and when had you decided to do it? Like had the plan formed in your head the moment Jeff announced the reward? Justin "Jay" Starrett: Yeah, he's like, "Oh, David won immunity!" And I'm like, "I'm about to eat this steak right now. Forget it." Reality TV World: Did you pick Adam and David strictly because of the reasons you said publicly, or did you also pick them because you figured you had a better chance of convincing them to keep you than you had of convincing Ken, Hannah or Bret? Justin "Jay" Starrett: No, I just thought the only two I actually have a chance to take me to the end would be Adam and David because I know I could beat Ken and Hannah, so I was like, "Let me see if David would actually bite onto this," and he almost did! It would've been sick. Reality TV World: Why did you ultimately cast your jury vote for Adam to win? Justin "Jay" Starrett: Just because I respect the guy. And I know what he was going through out there. I know his gameplay, so I just respected him and gave it to him. Reality TV World: How big of an impact do you think Adam's disclosure of his mom's illness played in his win? 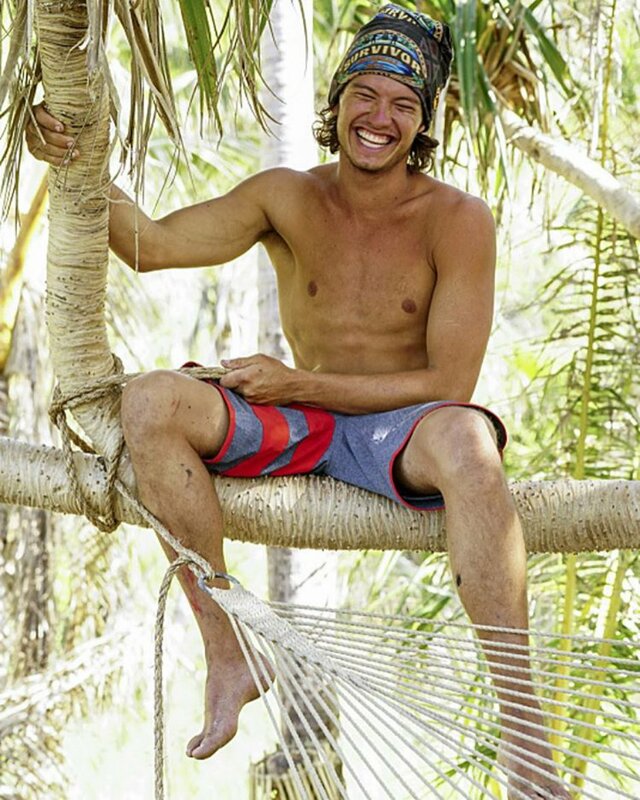 Justin "Jay" Starrett: I mean, it might have impacted my vote drastically because of the hammock scene or whatever, but for the other castaways, I don't know. I think everyone just respects the game so much that it wasn't like based off of that. It was more, "You made it," you know, "you did it" with the two people that everyone wanted to go to the end with. Reality TV World: Do you think Chris Hammons' campaign for Adam played any role in it? Justin "Jay" Starrett: I think everyone's decision was pretty much made before they even got in there. Mine was. Reality TV World: You openly talked to Bret about how one of you was going home before the Tribal in which you were voted out. Were you at all convinced walking into that Tribal that it was going to be Bret and not you? Justin "Jay" Starrett: Not convinced at all. I thought I had an idol and I was ready to use it immediately because I knew they were sending me home. I knew it. That's why at the moment [Jeff Probst] goes, "Oh this is not," I was like, "I'm out!" Reality TV World: After Sunday Burquest went home, you were lamenting that you weren't going to play your real hidden Immunity Idol and you had no idea why you played it. Do you still have no idea why? Justin "Jay" Starrett: No, I know why, because Sunday was sitting next to me and she knew she was writing my name down, so she was just so adamant on looking at me and telling me, like, "You need to play it! Do it, do it, do it!" So I was like, "Damn! If she's playing it, then I've got to play it." But I knew I shouldn't have played it. I should've gone with my friggin' gut. Reality TV World: Do you have any regrets? Justin "Jay" Starrett: Just covering those numbers in the challenge so no one could see them. Check Reality TV World's Survivor page for more of our exclusive interviews with this season's Final 6 castaways.